It usually takes time for big cultural waves to crest into the world of television. The morning after the 2016 election, ABC executives had an infamous meeting about how to better represent Trump voters with their programming, and it took about a year for the green-lit shows — most notably, Roseanne — to finally show up on TV. This spring, about six months after the first Harvey Weinstein stories broke, we’re starting to see bits of #MeToo in TV story lines. But early this morning, only a few hours after Roseanne Barr tweeted a racist slur against former White House staffer Valerie Jarrett, ABC announced that it was canceling Roseanne. “Roseanne’s Twitter statement is abhorrent, repugnant and inconsistent with our values, and we have decided to cancel her show,” ABC president Channing Dungey’s statement read. Suddenly, TV seems to be moving fast. 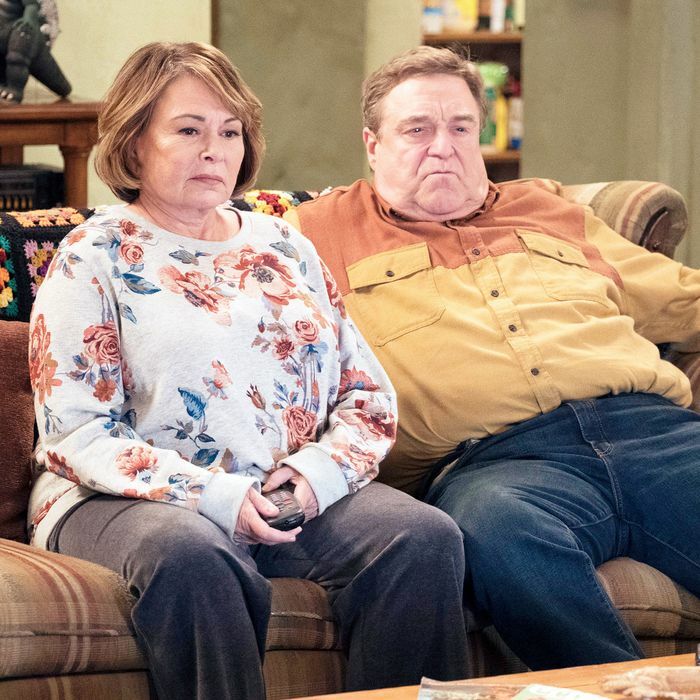 For all of those reasons, Dungey’s decision to cancel Roseanne feels like a gutsy move. It looks like a stand against racism, a line drawn in the sand to delineate what is reasonable and what is not. It even looks like a data point in the “How do we separate the art from the artist?” debate, and it offers a heartening answer: We don’t have to, because, in this case, ABC will not finance that artist. It’s somehow even more heartening because it comes from a massive corporate conglomerate that might lose money by making this decision. It feels remarkably just. It feels decent. I’m thrilled that Roseanne has been canceled. It was the right thing to do. But it doesn’t feel correct to hold up ABC as a new bastion of decency, either. I said that Roseanne felt like the Titanic, a ship that seemed too big to turn around — but in the aftermath of Barr’s tweet, it also seemed like a ship that was doomed. Earlier this month, we learned that writer and showrunner Whitney Cummings was leaving the show, and she mentioned that she’d been frustrated with her inability to take the show in the creative direction she’d wanted. This morning, after Barr wrote her tweet, Wanda Sykes announced that she wouldn’t return as a consulting producer. Emma Kenney, the actress who played Roseanne’s granddaughter, tweeted that she’d been about to call her manager to withdraw from the show as well. ABC’s decision to cancel Roseanne is a good thing, but it also seems like a decision to shut down something that was about to implode anyhow. The cancellation also comes after a slowly growing collection of stories that throw less flattering light on ABC’s creative direction. The network reportedly refused to run an episode of Black-ish that dealt with athlete protests during the national anthem. Its massive Bachelor/Bachelorette franchise has been the subject of rolling criticism, including the choice to cast a racist contestant in Rachel Lindsay’s season, and it came to light on Monday night that a new Bachelorette contestant reportedly liked social-media posts that mocked trans people, undocumented immigrants, liberal women, and the Parkland shooting survivors. And when Cummings discussed her experience on Roseanne, she noted that the network refused to let her include a story about Roseanne’s 5-year-old granddaughter finding an unsecured gun in their home, which would’ve been part of an episode about gun control. Most exasperatingly, ABC green-lit Roseanne in the first place, even though Barr’s blatant racism and loud support for damaging conspiracy theories were already well known. In the most favorable light, canceling Roseanne looks like a network suddenly taking a strong stance against racism. With a little more context, it looks like a network taking a strong stance against racism … in a way that also rids them of a show that was about to fall apart anyhow. It’s a good thing that Roseanne will not come back in the fall. Its season finale suggested that the show was entirely about thoughtless, un-insightful, tin-eared, and cowardly wish fulfillment for an imagined America, and I’m glad we won’t get to watch the show dig itself even further into injurious magical thinking. To be clear, its cancellation is a bombshell in the ever-fraught space between network television and national politics. My initial reaction was shock that this happened so quickly, and I don’t want to underplay how surprising it was to see ABC pivot in such an abrupt, unapologetic way. When a few weeks pass, though, this move may look more and more like an inevitability, even if it blows a giant hole in ABC’s fall schedule. Canceling Roseanne is a legitimately brave move, but it also has the benefit of being self-serving. It’s nice that this time, for once, the self-serving thing also happens to be a stance against racism.